What better way to start off February than with the debut of our new Candid Crafters interview series! 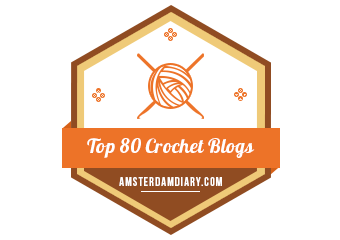 As part of this series, we will post a new interview with an amazing crochet blogger at the beginning of every month this year. The ever-delightful, ever-crafty Tamara Kelly from the Moogly blog was kind enough to take a few moments out of her busy crafting life to answer our questions. So, on to the interview! A: I started in either late 2001 or early 2002 – my first child was an infant so my memories from that time are a little bit sketchy! And of course I had no idea how life changing that moment would be! Q: What’s your favorite type of yarn to use? A: I’m a firm believer that there’s no bad yarn – every yarn has it’s place! 100% acrylic is always my go-to for blankets, because I’ve got kids and a dog and we actually do use them, so they’ve got to be both soft and tough! But when I get to make something for myself to wear, Merino and Alpaca and Cashmere get to come out to play! Q: What’s your favorite type of hook to use? A: I’m a big fan of Furls hooks, and the Clover Jumbo and Thread hooks. I crochet a lot, and need the ergonomic style to keep going! Q: Do you weave in your yarn tails as you go or save them all for the end? A: It depends on my deadline – I try to weave them in every few as I go, but if it’s a pattern for the blog with a deadline looming, I’ve been known to leave them all and tuck them to the back for the photos! Then I’ll sit and weave them all in when I have more time. I think weaving in ends is a great Netflix activity! Q: Do you have any fun projects coming up that we can spread the word about? A: My book, Quick Crochet for the Home, just came out this winter, so I’m busy promoting that and designing for the blog and magazines right now. No big unusual projects in the works yet this year, but there’s still time for sure! Q: What advice do you have for your fellow crocheters? A: Always be willing to learn new techniques and stitches – one of the best things about crochet is that there are always more things to learn! And stitch markers are a crocheter’s best friend – why make things harder than they have to be? Anytime I think “nah, I’ll just keep track” I end up regretting it! Our next Candid Crafters interview will be on Wednesday, March 1st. Many thanks to Tamara for her time and all of her crafty goodness! Previous postPattern Testers Have Been Chosen!